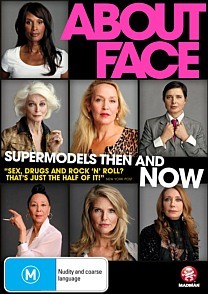 About Face Supermodels Then and Now DVD Review About Face: Supermodels Then and Now will be a bit of a treat for those who love fashion and follow the world of modelling. The world is intrigued by supermodels. There is no denying that. In About Face: Supermodels Then and Now, we get a behind the scenes look at the world of modelling from the people who know it best, past supermodels. The women who used to (and sometimes still do) grace dozens of magazine covers each tell their own tale about how they came to land in their profession and their journey through the years in the changing face of the profession and the new world of drugs and alcohol. They also face the inevitable question of what happens when old age sneaks in? Some of the supermodels who feature in About Face are Jerry Hall, Isabella Rossellini, Christie Brinkley, Paulina Porizkova, Christy Turlington and Beverly Johnson. The one thing that strikes you about About Face is that at 78 minutes, it is very quick. Yes, a lot is covered in that 78 minutes. However a lot is covered very quickly meaning that the topics are not covered in great detail. They seemed to be skimmed across at lightening pace in order to get as many topics as possible in. Yet, it is intriguing to hear these women whom the world is obsessed with speak from their own experiences. The short documentary itself does actually seem quite bland. There is not much more to it than the women just speaking of their experiences with the accompaniment of old photographs and some old video footage. Sure it is interesting, but there isn’t anything which one would consider completely and utterly shocking and things we would never have heard of if we just opened a book on or read an article on one of these models. The DVD special features consist of outtakes and a supermodel portrait gallery. The outtakes are worth watching just to have a bit of a giggle at and see the characters behind the faces. About Face: Supermodels Then and Now will be a bit of a treat for those who love fashion and follow the world of modelling. If this holds no interest to you, then you will find the documentary dull and 78 minutes may seem longer. However, there are still some very pretty faces to admire.